More than 230,000 people have been buried in Belfast's City Cemetery since it opened in 1869. More recently, both Belfast city cemetery and Milltown cemetery have been marred by anti-social behaviour leaving scorch marks on the ground, broken glass, and graffiti. Dara Barrett and Aidan Crean spend their Monday mornings in December teaching school pupils about the wealth of history that lies behind the cemetery's gates. Dara's day job is also at the cemetery. He strides the 26 mile pathways through the gravestones with confidence. "By the middle of the 1860s most burial grounds in Belfast were at bursting point. "The Belfast Corporation opened a new burial ground for all denominations. "This included people of the Catholic, Protestant and Jewish faiths, it's a microcosm of Belfast life." Aidan is a local environmentalist who pauses to point out the squirrel running through the stone memorials. "Look at some of those old headstones, they're stunning" he said. "The city cemetery is coming down with monuments like this. "Sadly there's been too much anti-social behaviour over the last lot of years and despite all the great work, it's got worse. "The burning of the gates in Milltown shocked everybody, that's what motivated us," he added. 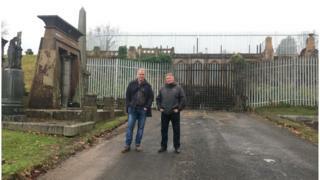 The elaborate tombs of James Harland, of Harland and Wolff, and Thomas Gallaher, who was known as the Tobacco King, are now guarded by a tall steel fence. Walking on, something catches Aidan's eye. "A Gold Thrush," he points. "We catch birds on the tours. I'm a bird ringer with the British Trust for Ornithology. "We want to raise the profile of the biodiversity and the conservation value of the cemetery," he added. The two men step round a bin that looks like it was set on fire. The tarmac below is damaged and there is broken glass nearby. Dara points further up another walkway where a council worker is power-hosing paint from a memorial. "He's blasting the Cross of Sacrifice - it is dedicated to the men and women of the First World War," said Dara. "But at the weekends it's used as a table and people come along and put their drinks on it." The Jewish section of the cemetery was desecrated last year, with approximately 15 graves attacked. Dara said those who carried out the attack "also wrecked Protestant graves, Catholic graves, military graves, babies' graves". "Again there's the council being very proactive. CCTV installed - first ever in the cemetery," said Dara. Aidan points out that he has spotted four separate teams cleaning and maintaining the cemetery during his walk. "It's good to see," he added. In the new year, Dara and Aidan will speak to more school groups, teaching them about the history and environment of the cemetery. They hope that educating young people will make them less inclined to set fire to or graffiti over monuments. Dara believes that while on a tour they have already met some of those behind the attacks. He said: "There are certain kids who have commented on the vandalism. "When we bring them to Gallaher's steps we ask do they know it and they say yes, they do. "We try to emphasis, 'If this was your loved one's grave, your granny's grave, would you like it?'" Aidan added: "We're just trying to turn it around."